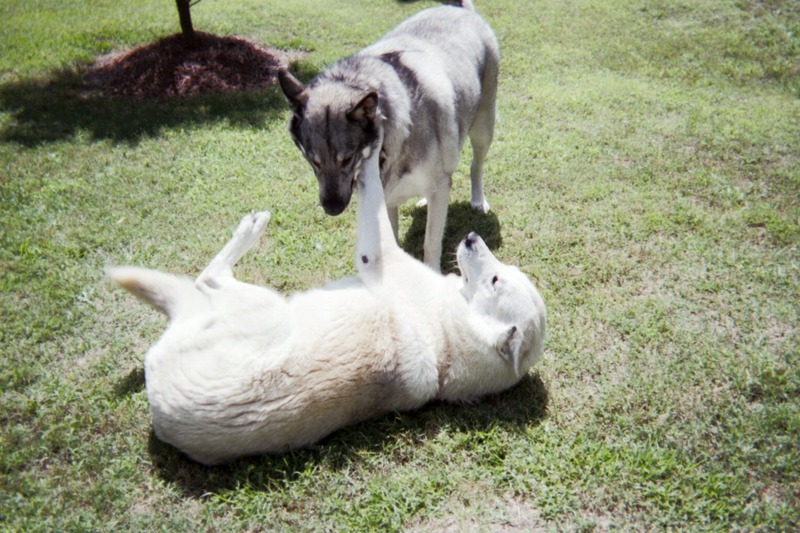 My name is Cherokee, and my mom is 100% MacKenzie Wolf and life as a hybrid is sometimes confusing. I lying on the grass, and the dark handsome boy, is my son, Rocky the Man. I love my people, but I would have been an alpha and taking orders…like, ‘sit, down, and no,’ just doesn’t work for me. However, when I can, I try and please them…they are so cute and my man person makes a flirt out of me. 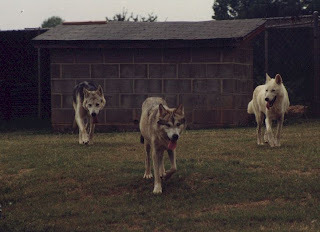 I had the wander lust in me, howling for a pack, and my people thought I needed my own pups. I had five beautiful treasures. Just as I would have in the wild, I appointed my female person as my nanny. When it was time for them to leave our den, my female person sat with me and my son, Rocky the Man, and we cried and howled together late into the night. They send pictures, and Rocky’s brothers and one sister are all over 175 pounds, but Rocky is 190 lbs. He too would have been an Alpha—except that he is a bit of a clown. He likes to eat, and because his father was all German Sheppard, he does take orders from our people. He is a big mush, and snuggles them more than I like. I have tried to show him that we only snuggle when we want to be massaged. My eyes are yellow like my wolf mother, Vanilla Ice, and my feet like hers are webbed as we wolves are wonderful swimmers. Our people take us to a nearby lake and Rocky and I have a blast. Our people have a horse and he thinks we should be friends. Not happening. However, Rocky the Man adores the horse…they call him Pride, and so I make allowances. My son likes to run with him. At times, I do as well. My female person has pictures of us that you may wish to glance at. There is also a picture of my mother with a friend, an alpha MacKenzie called Shawnee, and his brother Yellow Tail. Have a peek, I hope you like! What a great post! I love wolves, they area a lot like huskies which I have wend my whole life. Thanks for sharing!! Oh they're all beautiful you'r so luck to have pets that are partly descended from wolves although it must be some work taking care of them. The pictures are gorgeous and I love how you gave Cherokee a voice and let her "talk" about her family, very unique! They are beautiful, especially Cherokee. I would think having hybrids would be somewhat difficult at times, generally animals that have been domesticated for a longer time are more people oriented. But the right animal, with the right people can be great no matter if the animal is "wild" or domestic. Beatiful animals! You sound as though you're well informed on what it takes to raise hybrids--they are different, I know. Your gorgeous wolfies look so content. Beautiful creatures! I think my fav is Rocky -- I love wolves AND German Shepherds (but don't tell my pugs!) 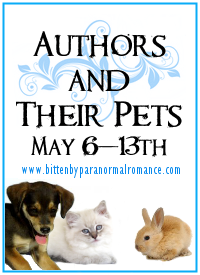 Thanks for sharing your gorgeous pets with us! Beautiful pictures. I love that look of wolf. And Pride is just adorable. Thanks for sharing.